Light weight – two people can easily lift the goals out of their sleeves and move to a storage area in the off-season. Install extra sleeves so the goals can easily be moved to a training area or cross field games to conserve the sports pitch and then move back on game day. Less cumbersome than free standing goals to move and safer as will not topple over. Low maintenance and durable – high quality aluminium alloy finished in a quality powdercoat for protection from the harsh Australian climate. Models are available with a two piece cross bar, making storage in the off-season easy. Corrosion resistant – aluminium will not warp, rot or rust. Rust can be dangerous as it weakens vital load points as these often go unseen until they fail. Why risk it. Designed to International standards – unique oval profile allows the ball to slide off, not bounce off the frame. Special internal ribs give these goals maximum strength but also makes them lightweight and safe. 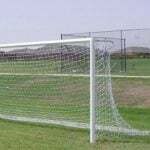 The ribbing and thickening inside the extrusion give these goals extra strength, especially where needed like the front of the posts. Safe – the goals are installed in sleeves in the ground making the very safe as they will not topple over. The large profile size makes it difficult to hold on to thus discouraging people to swing off the cross bar. If vandals tamper with the locking bolts, the goals will not come apart and injure users. Net hooks are recessed into the profile to comply with OH&S requirements and do not fall off. Installation – easy for DIY installers or contact Hi Tech Sports for their professional installers to do the installation for you. Various models – senior 7.32m x 2.44m, Junior sizes 5m x 2m, Futsal 3m x 2m. 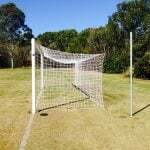 P shaped goals, International goals using a FIFA box shape nets, beach football with portable bases, combination rugby/football goals, futsal goals and all standard and special size nets that you may want. Model FIFAP – P shaped goals, suitable for clubs and parks with the net supports. Model FIFAINT – International goals using a FIFA box shape nets supported in rear net posts. For more competition standard. Model FIFANF – folding lower net frame to support the bottom of the net. Can be folded up during mowing or when not required. Model ALMG – 3m x 2m aluminium futsal size goal with folding sides. Optional sleeve and spigot system for outdoor use. Model FOOTCOM – combination rugby or league/football goal. Foldaway Football Goals – mounted to posts behind the field, these goals are attached by arms and sit on roller wheels so they can be folded sideways flat against the fence and then required will fold/roll back out into the play position and held in place. No sleeves on the playing field. HiTech Sports has a complete range of corner flags, and post padding for AFL and all other sports. Flag and banner poles are also available in fibreglass or aluminium.